Successfully leverage technology to enhance classroom practices with this practical resource. 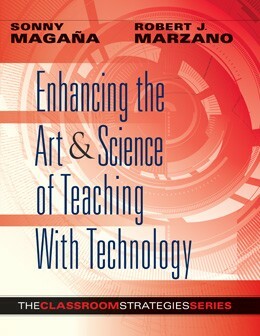 The authors demonstrate the importance of educational technology, which is quickly becoming an essential component in effective teaching. 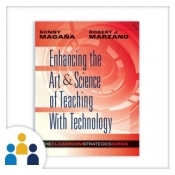 Included are over 100 organized classroom strategies, vignettes that show each section’s strategies in action, and a glossary of classroom-relevant technology terms. Key research is summarized and translated into classroom recommendations. Gain a greater understanding of the theory and research behind technology and how it enhances teaching practices. Discover how to seamlessly incorporate technology into your current instruction. Explore the 41 elements of effective teaching to boost students’ academic achievement. Learn your own unique pedagogical strengths and areas in which you would like to develop greater proficiency. Master the Art and Science of Teaching framework, and gain practical implementation strategies for any classroom. These reproducibles include handouts to copy and share, as well as forms you can fill in electronically. See all reproducibles for this book. Every teacher should read this book! This book is a must read for the modern educator! I've already used many of the strategies in this and my students have responded brilliantly! “Sonny Magaña and Robert Marzano have the rare ability to translate complex research into practices that teachers can understand. Adapting the well-known framework from The Art and Science of Teaching of 9 design questions and 41 key elements, they provide a handbook for how teachers can harness a wide range of technology tools to create the transformed classrooms promised by the Digital Age."